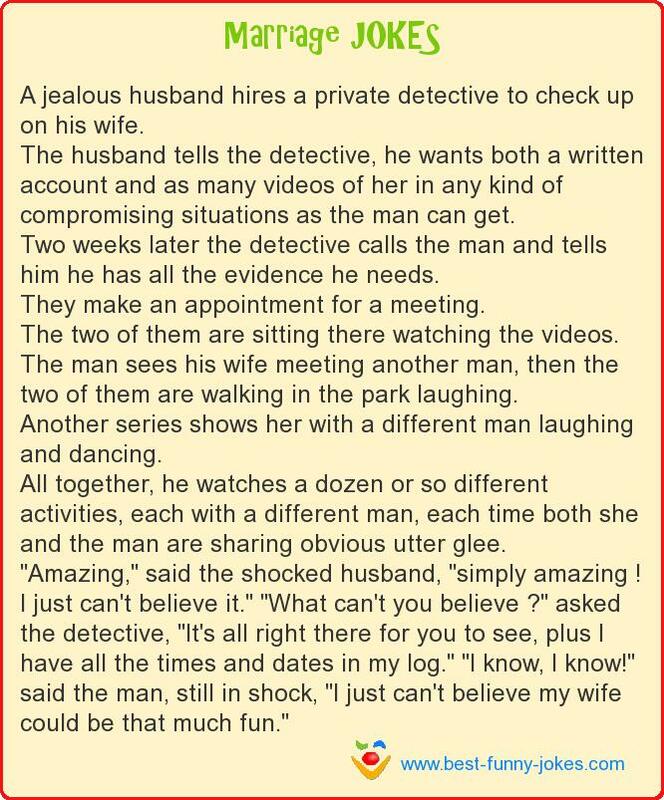 A jealous husband hires a private detective to check up on his wife. The husband tells the detective, he wants both a written account and as many videos of her in any kind of compromising situations as the man can get. Two weeks later the detective calls the man and tells him he has all the evidence he needs. They make an appointment for a meeting. The two of them are sitting there watching the videos. The man sees his wife meeting another man, then the two of them are walking in the park laughing. Another series shows her with a different man laughing and dancing. All together, he watches a dozen or so different activities, each with a different man, each time both she and the man are sharing obvious utter glee. "Amazing," said the shocked husband, "simply amazing ! I just can't believe it." "What can't you believe ?" asked the detective, "It's all right there for you to see, plus I have all the times and dates in my log." "I know, I know!" said the man, still in shock, "I just can't believe my wife could be that much fun."